Back into spring, into heavy training mode, that time when so many thoughts inevitably turn toward one of my favorite subjects: food. In addition to the nutritional decisions we make for breakfast, second breakfast, lunch, snack, after school snack, tapas, dinner, and dessert (Um, you have these decisions too, right? ), we endurance athletes also have to put some thought into what sustains us out on the trail. I am one of those few runners who doesn't really love to talk gear. I think it's a result of having worked in gear stores for so long. (And plus, you know what? You really don't need most of that stuff! Shhhh!) But I can talk food forever! Especially while on trail. 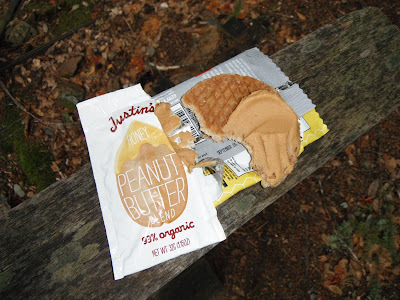 So, I thought I'd share some of my trail food loves in the hopes that it will give you all some new ideas of what to try. I'm hoping, of course, for some of your brilliance in return. Classic Standby: PBJ -Tastes good. Sits well. Always have it at home. Always available at aid stations. Standard Race Fare: GU -Any flavor. Immediate rescue from an "inevitable" bonk. Thirst Quenching: Honey Stinger Pink Lemonade Chews. Seriously, these taste like "cool and refreshing on a hot summer day." I don't know how they do it. When I'm Feeling Pukey: GU Chomps. Calories that never come back up. So? Lay it on me friends. What do you love before, during, and after those long runs and races? The first anual Young Life 5k run/walk 10k run is scheduled for 9am, April 28th at Shawnee Mission Park. It is a benefit for Kaw Valley Young Life. 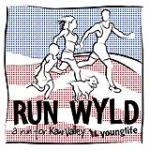 The Run Wyld is a fun-filled event for all ages and includes a 5K Run/Walk, 10 K Run. The event benefits Kaw Valley Young Life, a year-round program for middle school and High schoolers in the Basehor, Bonner Springs, Mill Valley, and Desoto School Districts. The money raised will help offset the cost of camp dues, allow campership scholarships and aide in the growth of the program and allow us to reach out to more Middle and High school students in the Kaw Valley area. To become a greyhound, you’ve got to work like a dog, says Debbra Jacobs-Robinson of San Diego, California. And she has. At this Sunday’s Honda Los Angeles Marathon, Jacobs-Robinson will run her 121st marathon as a leader with the CLIF Bar Pace Team. Michael Seymour keeps a group of runners on pace at the Marine Corps Marathon. Skip Expo Snacks As tempting as it is to try new bars and drinks at the race-weekend expo, don’t. Last thing you want is an upset stomach—or worse, diarrhea—at mile 9 thanks to unfamiliar food. Wear Arm Warmers They provide the perfect bit of protection from the cold, easily roll down when temps rise, and can hold gels if you don’t have pockets. I’ve even used them to carry my hotel room key and a few bucks, just in case. Don’t Race to Win There will always be someone faster or capable of running farther than you. Run for your own personal goals—weight loss, general fitness, completing a marathon, winning a bet. Maybe you’ll get lucky and win a race someday, but if that were everyone’s goal then about 40,000 runners failed in the NYC Marathon last fall. Picture the Finish Line At the start of the race, think about the end. Imagine yourself coming down that final stretch. All soreness disappears as soon as you hear and see people cheering, clapping, even yelling your name (make sure it’s written somewhere visible). See yourself pumping your fists under the big banner, smiling wide. Replay this over and over until you’ve made it a reality. Tailor Your Training Whether you’re training for your first 5K or the U.S. Olympic Trials, one thing is universal—have fun. If it’s not, it probably won’t last. Don’t be afraid to tweak training plans and advice to make them more enjoyable for you. Keep it Real Life loses focus when any one area (work, family, even running) becomes too dominant. Keep your running goals reasonable and attainable. This way, after a good run, you’ll be better prepared to deal with everything else. Enjoy a Time Out Take a break from your watch or heart rate monitor to reconnect with your body. A digital display can be an inaccurate distraction of what performance level you’re really capable of achieving. Brighten Your Step Don’t wear the usual white top and black shorts. Loud colors help family and friends spot you from the sidelines. Pick a Side Another way to help your personal cheering squad find you: Tell them what side of the road you’re going to be on so they don’t search for you on the wrong side. Make Yourself Findable Text family and friends a quick photo of yourself in your race day outfit in the morning. This way, they’ll know exactly what you’re wearing and what to look out for from the cheering sections. So you’ve learned how to meditate and has been diligently putting it into practice for some time. Thanks to your consistent daily practice, you can now focus better and is also more aware of what’s running through your mind most of the time. That means less hotheaded reaction and less stress for you when conflicts arise because you’re able to return to your breaths and find your center quicker than before. You may even start to appreciate things which you usually take for granted, and begin to relish life at a slower pace and with a more upbeat perspective. You’re amazed by what 20-minute of sitting each day has done to your life. And now you’d like to take it further and build on top of the foundation you’ve quietly laid for many months. In this article, you’ll find the tips you need to deepen your meditation practice and raise your consciousness to the next level. Dive right in when you’re ready! The commitments you need to invest in a one-day local course versus a seven-day retreat in India are different. Likewise, if you want to meditate deeply, you’ll need to put in more time and sacrifices in order to spend more time on the cushion. You may have to wake up earlier in the morning, cut down after-work drinking with your colleagues, or watch less TV at night. If you’re not living alone, you may also need to discuss your decision with your family or the persons you’re living with so that they’d understand, and respect, what you’re planning to do. Imagine your mind as a river that gets deeper and deeper as you go farther and farther away from the bank. For most beginning and intermediate meditators, the first 10 to 20 minutes of meditation is like taking the initial steps into the river and paddling in the shallow waters. In order to go farther, you’ll need to give yourself more time to ‘swim’ into the deeper ends of consciousness. If you find it difficult to sit for a prolonged period all of a sudden, extend your meditation time progressively by adding ten minutes to every session. Aim to meditate for an hour or more every day. A stiff shoulder, a tensed body or even hunger can be a source of distraction. It will be immensely useful if your body is totally relaxed before you begin to meditate. This allows you to go into a meditative state faster. Do some yoga poses or allow yourself some time to calm down before starting meditation proper. Eat at least one hour before meditating. A light snack just before meditation is fine. Repeating a mantra is a very good way to bring you deeper into a meditative state. If you’re a Christian, you can use the ancient prayer word Maranatha, which means “Come, O Lord!” Say the four-syllable word either softly or silently to yourself with full attention after every exhale. If you’re a Buddhist, there are many mantras you can use, such as the one recorded in the Heart Sutra. Just choose one that appeals to you most. If you don’t have a religion, your selection gets even wider. Practically, any positive word or phrase that means something to you, like love, I am light or carpe diem (seize the day), can be used as a mantra. No matter what you hope to achieve with meditation, when you’re sitting, let go of all your wants and goals. Allow what you want to come spontaneously and effortlessly. Anticipation will only get in the way by creating unnecessary tension that blocks the flow of your meditative experience, and leads to disappointment that kills your motivation to meditate. Unlike other aspects in life where the harder you push yourself, the higher your chances of succeeding, the reverse is true when it comes to meditation. The more you let go, the ‘more’ you’re likely to get. But of course, even this very notion has to be given up when you’re in the thick of meditation. As you sit for longer period of time, the likelihood of getting distracted, bored or impatient will inevitably increase. So it’s important to return to your breaths or mantra again and again as if your life depends on it. Remind yourself to simply sit. Not sitting and thinking about your unfinished project; not sitting and planning for your next meal; not sitting and replaying the argument you just had with your neighbor. Just sit and breathe, or repeat your power mantra. You can do the other things after your meditation has ended. In fact, it’s useful to temporarily forget who you are during meditation. Let go of your identity, your unfulfilled dreams, your unmet desires, your beliefs, your body, your distant past, your imaginary future, and whatever that fills your mind. Be the unborn. When your meditation practice deepens, you may encounter new experiences which could come across as either blissful or frightening. Usually, it’s frightening not because of the content but by virtue of it being new to us. Humans are easily alarmed by the unknown, and it’s the same in this case. Whatever ‘extraordinary’ sensation or imagery you may face, don’t panic. If it’s something pleasurable, don’t try to hold on to it either. As mentioned in #6, what you need to do is simply to sit resolutely, concentrate on your mantra or breaths, and let the experience pass through you like a cloud. Any other things, no matter how wonderful they are, are only distractions. I finished the Pi-Day Half Marathon in 1:50 on the clock. My knee was a little sore. I think it was from running on the right side of the trail most of the way. When I made a conscious effort to run in the middle it started feeling better. I need to make a note of that for the Free State Trail Marathon next month. Hopefully the results will be posted later today. Feeling better; the headache is gone and the sinuses feel good. Did another 3 miles on the TM but managed to breathe through my nose the whole time which is a good thing. I should be all ready for the Trailhawks Pi-Day Half Marathon Sunday morning. VIVOBAREFOOT Breatho Trail Follow-Up Review: Back in January I offered a first look at the VIVOBAREFOOT Breatho Trail, running down the specs and offering my impressions of the shoe after all of 2 runs (long-ish runs, but still). At that time, the shoes weren’t available for purchase, but they are now – which seems like a good time to circle back for an updated review after giving them a much more thorough test of nearly 200 total miles. However, I’m not going to be super thorough in rehashing all the information I provided the first time around – for that, I’ll refer you to my original review from January. Rather, I’ll do a rundown of the specs and put together some observations of things that really stood out in my testing. Of course, with VIVOBAREFOOT it goes without saying that the Breatho meets virtually every minimalist construction aspect that purists demand: it’s completely flat and flexible in all directions, allowing your foot to move in any way it wants to. Ground feel is surprisingly good considering the size of the lugs, especially if you take out the removable insole. My preference is to keep the insoles in my pair, because with it removed the Breatho Trail feels a little loose and sloppy through the heel and toe box. I had this same issue with last fall’s Neo Trail as well several other minimalist shoes I’ve tested; functionally, removing the insole is like stepping up a half size in overall fit. I may consider requesting shoes a half-size smaller for reviews at some point, but for the time being I’m a pretty consistent “insole IN” kind of guy. Traction of the lugged outsole is really outstanding in most trail conditions including loose dirt and sloppy mud. The only issue I’ve noticed is that the rubber compound is somewhat slippery on wet rocks, so I find myself being extra careful when hopping across streams. One quirk I can’t quite figure out is something I identified in my preview: that the laces don’t hold their tension during the course of a run, leading the upper to feel looser after a few miles. It’s weird, because the laces don’t actually come loose or untied – they just lose their grip on the neoprene liner on top of the midfoot. The laces also happen to be about twice as long as they need to be. If I had a magic wand - or if VIVOBAREFOOT listens to my feedback – I’d make the laces significantly shorter and use a different kind of material, perhaps something like New Balance’s “sausage link” laces to help them keep their grip. The other point of feedback I mentioned in my earlier review is that the Breatho Trail weight is far higher than I like in a minimalist shoe. It’s nearly 50% heavier than equally rugged trail shoes from Vibram and Merrell – and when companies like New Balance are lowering the weight bar to amazing degrees (hint: Minimus Zero review coming soon! ), it’s disappointing that VIVOBAREFOOT can’t get low, low, low, low like everybody else. In the case of the Breatho Trail, it’s especially frustrating because in practically all other aspects, this is a fantastic shoe. Even with the weight as is, I would have no worries whatsoever about wearing these in any ultra I encounter, including distances of 100K or even 100 miles. If the shoe were a bit lighter, it would be at the head of the class in the increasingly crowded category of high-performance minimalist trail runners. As it is, the Breatho has become one of my favorite training shoes this winter. The VIVOBAREFOOT Breatho Trail is now available for $90 from the company website. Trailhawks Pi-Day Half on Sunday! I managed to squeak out 3 miles on the TM last night; still not feeling that well. I'm running the Trailhawks Pi-day half marathon on Sunday and I don't want to do it with this blasted headache.